This tutorial is now out of date, and has been superseded by this newer version of the same tutorial. 7. 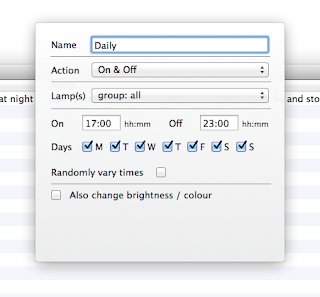 Press the Schedules button or ‘Show schedules’ from the View menu (command-2 also shows this window). 8. Press the [+] button at the bottom-left of the Schedules window. 9. Type ‘Daily’ for the name, select ‘On & Off’, select ‘group: all’, type 17:00 for on and 23:00 for off. Leave all days selected. Click somewhere outside of the small window to save and close those settings. All lamps are now set to switch on at 5pm and off at 11pm. 10. Select t’he All warm’ preset and make sure that the ‘Listen’ button isn’t pressed in. 11. If you make a noise, you should see flashing lights in the level indicator. 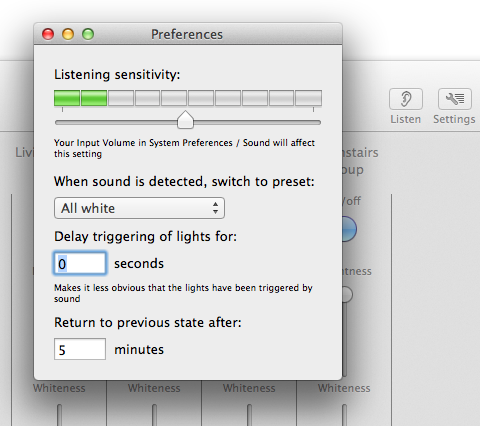 This uses your sound input source set in System Preferences > Sound > Input, so check there if you can’t see a sound level being indicated. 12. Adjust the slider so that you see red lights if you walk around the room or open a door. 15. Return to the manual control window and click ‘Listen’ in the main toolbar. You’ll see that there’s a delay of 60 seconds which you can use if you are leaving the room or the house. 16 Click ’Start now’. The computer is now listening for sound and will respond by turning up all of the lights if it hears a sound. if there’s silence for 5 minutes, the lights should go back down again. Thank you for your interest. Hue-topia is new and still in Beta at this time, so I appreciate all feedback. I do bear in mind that people will use other apps as well. First of all the name that you see on each control strip (and can change using Hue-topia) is the name of the lamp as held by the bridge, so other apps should call each lamp or group by the same name. Second, at present (this may change) the lamps appear in id order, ie numerically from left to right, and the groups appear to the right of the lamps and they also appear in numerical order (starting with zero for the 'all' group if it's showing). Thank you for trying Hue-topia. Does the lamp switch on and off when you use the on / off button in the control strip? When you look at the schedule list, is the 'enabled' checkbox checked? If you could send the answers to support@peacockmedia.co.uk that would be better than comments here.